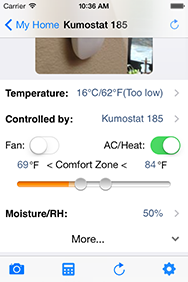 Kumostat ("pronouced Koo-mo-stat”) is a cost effective cloud (kumo/くも in Japanese) connected thermostat that works with other cloud connected new KumoSensors and Wireless Sensor Tags currently in production. 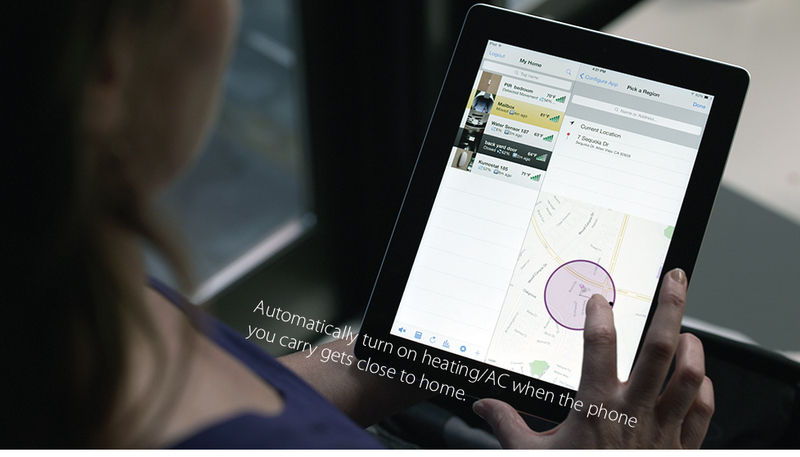 The iOS app and web interface allow you full control and automation of heating/AC at your home or apartment buildings from iPhone/iPads or any Web browser anywhere with Internet access. 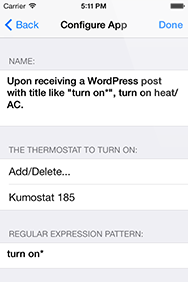 With Kumostat, you can write your own algorithms or use those other people wrote (KumoApp), to automate the heating/AC/fan based on data from Wireless Sensor Tags. 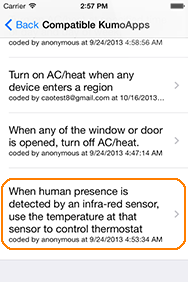 For example, you can "automatically turn off heat when sensor upstairs reports too hot", "set temperature at the room where the PIR sensor last sensed motion", "automatically turn off AC and turn on vent when outside sensor tag shows cooler temperature than inside sensor tag", or "turn off AC if door is left open or no motion is detected after a timeout". 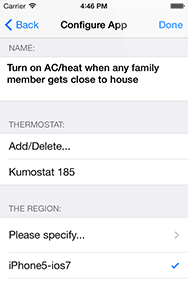 Take advantage of KumoApps that use location of your iOS and Android devices to automate heat/AC at your home: for example, you can "automatically turn off heat/AC when all of my family member's mobile device moved out of my house", or "turn on heat/AC when any family member's mobile device is about to get home". 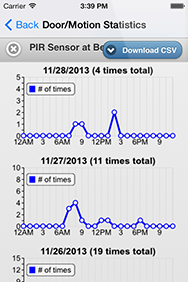 PIR and Reed KumoSensors are currently shipping. While Kumostat hardware is under development, you can link your Honeywell WiFi Thermostats or Nest Thermostats with KumoSensors and Wireless Sensor Tags today to use nearly every Kumostat features advertised here on our iOS and Android/Web app. 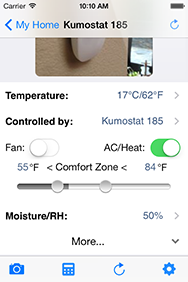 Kumostats controls heat/AC using not only readings from its internal precision temperature/humidity sensor, but also temperature readings from any of the Wireless Sensor Tags (motion, water, contact or infra-red) in different rooms in your house or in your garage. 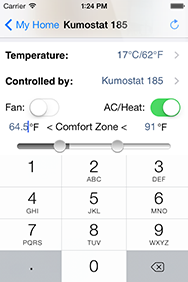 You can choose which sensor one to use, or have a KumoApp automatically pick a temperature sensor for you. 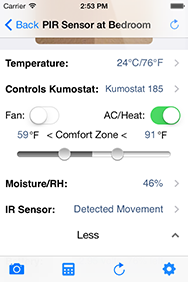 Tap on the Kumostat to see its detail screen, then tap "Controlled by:" to choose which sensor to use. 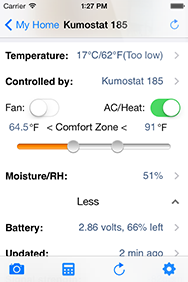 Alternatively, from any of the sensor's detail screen, tap "Controls Kumostat:" and choose which Kumostat this sensor will control. 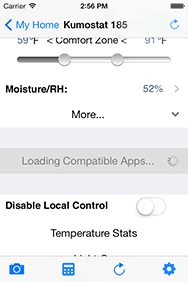 You can then directly control the comfort zone settings there. 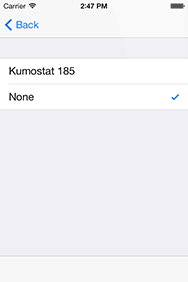 Tap "Install KumoApps" from the Kumostat detail screen. 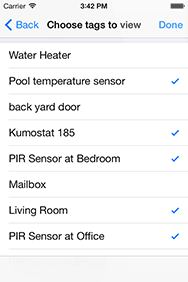 Choose "When human presence is detected by an infra-red sensor, use the temperature at that sensor to control thermostat"
Tap the "+" button to add applicable PIR sensors, choose applicable Kumostat and tap "Save". 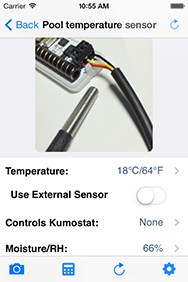 Kumostat works with your existing Wireless Sensor Tags utilizing their integrated temperature sensors. 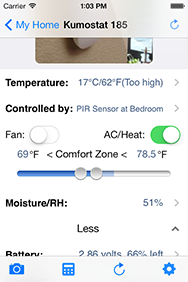 In addition, we introduce a new wireless infra-red (PIR) occupancy + high precision (+/-0.4°C) temperature + air humidty sensor "KumoSensor™". 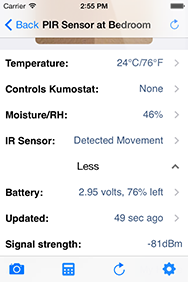 Wireless PIR Kumo Sensor detects motion of human/vehicle. 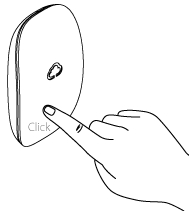 Tap on the gear icon at the bottom of the screen to access motion sensor options. 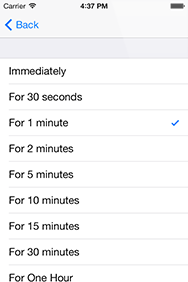 Along with notification choices, you can configure a 'time out period', when no motion is detected for this period, a time out notification is sent. 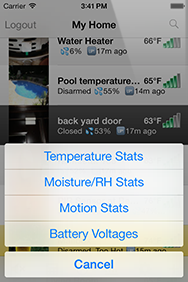 Tap on "Motion/Occupancy Logs" at the bottom of PIR sensor detail screen. 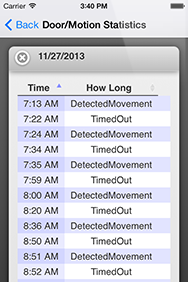 Daily graphs showing when motion has been detected for the last 60 days are displayed. All data can be downloaded as CSV file. Tap on a graph to open a detailed log screen for the chosen day. 3D compass based Wireless Motion Sensor tags detect any angle change by itself, and can be installed on any moving part of door/window to allow detecting open/close. But they are not the most reliable way for monitoring door/window opend/closed status, as they report closed when the their angle returns to within a threshold, not when door/window is completely closed. Since they are based on periodic polling, if a window is opened and then closed quickly, it may miss the event. The new Reed KumoSensor™ uses a low power contact-based door/window sensor to send you notification immediately when it is moved away from/back to a matching magnet piece, with 3~5x longer battery life. Like other KumoSensors they integrate a high precision (+/-0.4°C) temperature and relative humidity sensor. In addition, you can attach an external water-proof temperature probe* using a screw driver. 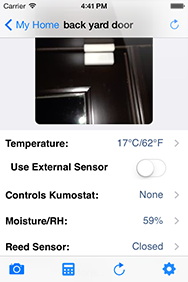 The Reed KumoSensor monitors window/door by sending events to the cloud immediately when put in contact with/away from the matching magnet piece. 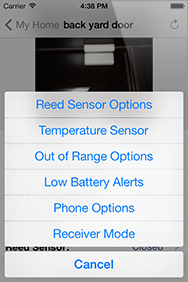 Tap on the gear icon at the bottom of the screen to access reed sensor options. 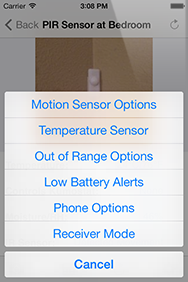 Along with notification choices, you can configure the open event be triggered only when door/window is opened for too long. 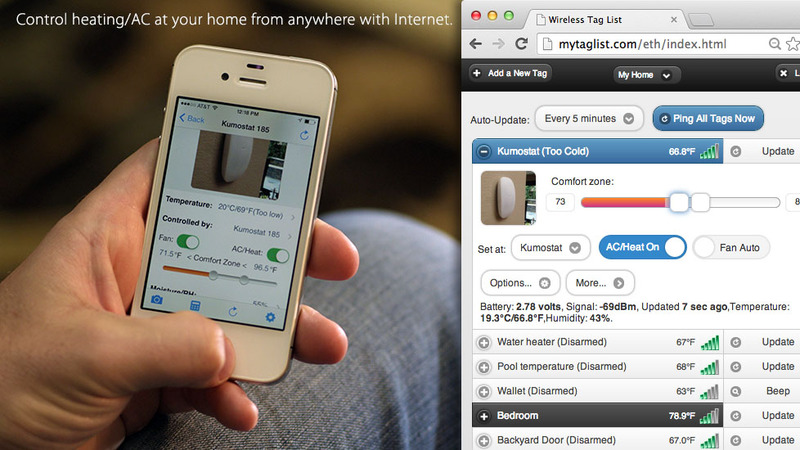 This is useful in conjunction with KumoApps like "turn off AC when window/door is open". Click the stat icon on the bottom of the tag list, and choose which type to view. 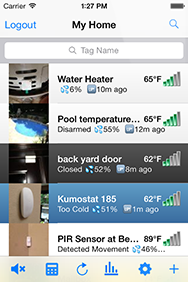 Choose up to 5 tags/sensors/kumostats to view at one time. 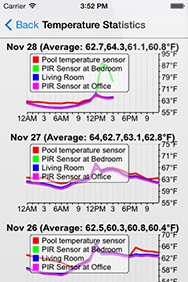 Daily temperature, humidity, motion or battery graphs for the last 60 days are displayed. Attach pin 1 (closest to edge of the board) to ground (black), pin 2 (middle) to data (yellow or white), pin 3 (closest to antenna) to vdd (red) wires. 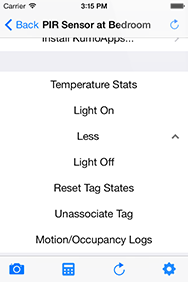 Turn on/off the "Use External Sensor" switch. The KumoSensor will attempt to detect any attached DS18 series temperature sensor/probe, and reports the serial number of detected probe. *DS18B20 series, as an available option. 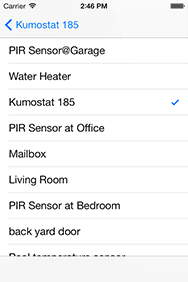 Tap "install kumoapps" to open a list of existing kumoapps compatible with the kumostat/sensor tags you have. Tap on the generalized name of the app to re-name it to something that reminds you of its specific purpose, and choose tags. 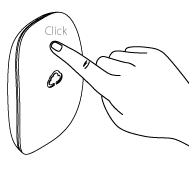 Click Done to install the KumoApp you have just configured. 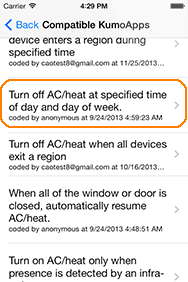 Pick the app called "Turn on AC/heat at specified time of day and day of week." Change the name of the app so you remember what it does later. 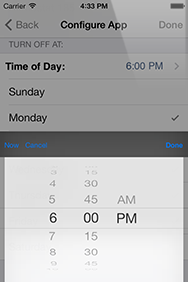 Specify time of the day and days of the week. 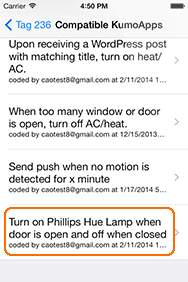 Pick the app called "turn on Phillips Hue Lamp when door is open." 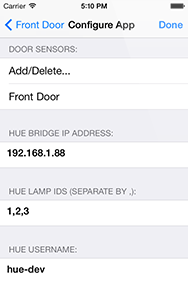 Configure the ID of the lamp to turn on as text, and the choose from the list of door/window sensor that can activate the lamp. 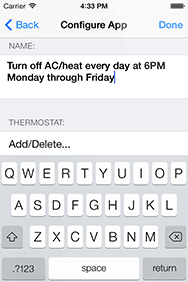 In another app you can also specify if some event happened on IFTTT to turn on/off heat/AC. mytaglist.com acts like a WordPress blog to receive event from automation services like IFTTT. 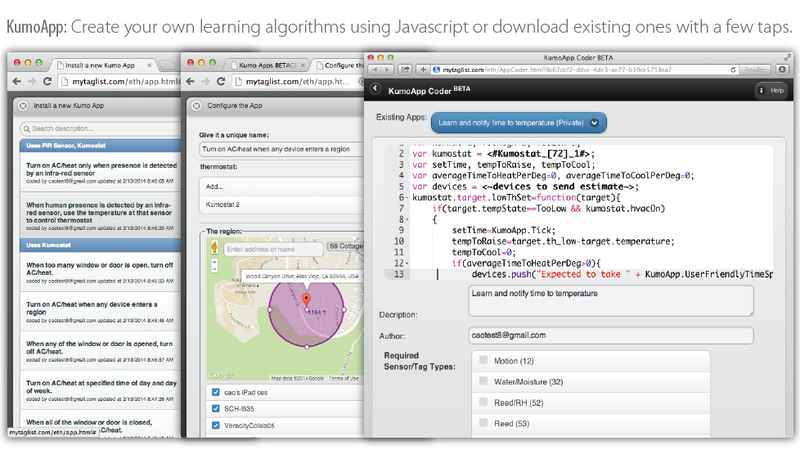 Some KumoApp can use the location of mobile devices of your choice as triggers. 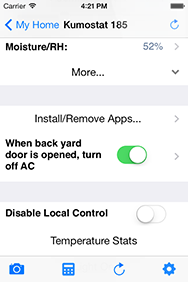 For example, "turn on AC/heat when any one of the phones gets close to a location", or "turn off AC/heat when all of the phones exit a region". 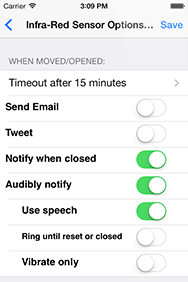 Configure these rules easily using our iOS app. 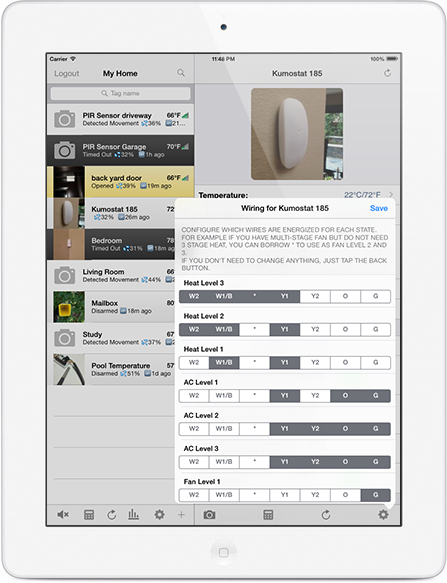 Without any KumoSensors, a Kumostat by itself and a Tag Manager (can be shared with other Kumostats) can automate your HVAC to cut the energy bills. 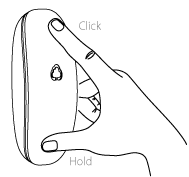 Check & uncheck the mobile devices to be used as part of the trigger. 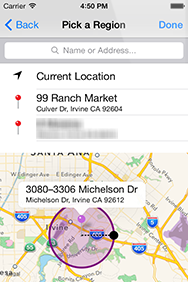 Use current location, search for a location, or use previously chosen location. 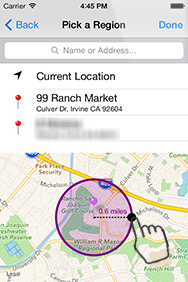 Tap and hold the pin to move it to anywhere on the map. Drag the black circle to define radius of the region. The left handle (cold threshold) controls heat, drag it above the current temperature to turn on heat; the right handle (hot threshold) controls AC, drag it below the current temperature to turn on AC. 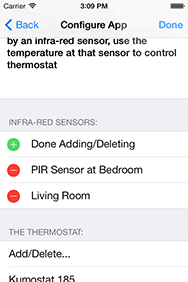 When the temperature at specified sensor reaches within the "comfort zone" heat/AC are turned off. 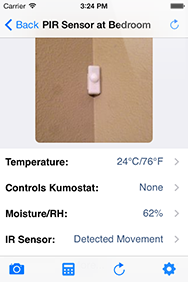 The zone slider displays current temperature, a left handle to control heat, and a right handle to control AC. Drag the left handle above the current temperature to turn on heat. Drag the right handle below the current temperature to turn on AC. 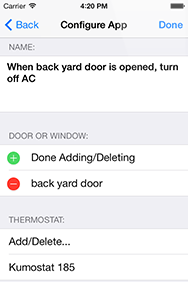 Alternatively, click on the tempertaure number to precisely enter the threshold to turn on heat or AC. 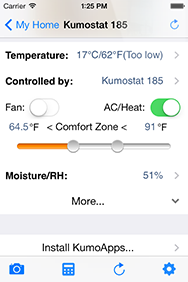 When the temperature at specified sensor reaches within the "comfort zone" heat/AC are turned off. Click the upper region once to set cold threshold for comfort zone to ~5°F above current temperature, press twice to set it ~10°F above, and so on. An orange light indicates heat is turned on. If AC is currently on, raise the thresholds by 5°F until when blue/orange light both flashes to indicate heat/ac is turned off. Click the lower region once to set hot threshold for comfort zone to ~5°F below current temperature, press twice to set it ~10°F below, and so on. An blue light indicates AC is turned on. If heat is currently on, lower the thresholds by 5°F until when blue/orange light both flashes to indicate heat/ac is turned off. 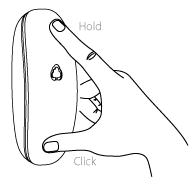 Click the upper region while press and holding the lower region to turn on fan. Click twice to increase fan speed. An green light with corresponding intensity indicates fan is turned on. Click the lower region while holding the upper region to decrease fan speed until fan is off. An green light that rapidly flashes twice indicates fan is turned off. Solid state relays make Kumostat compact and silent. 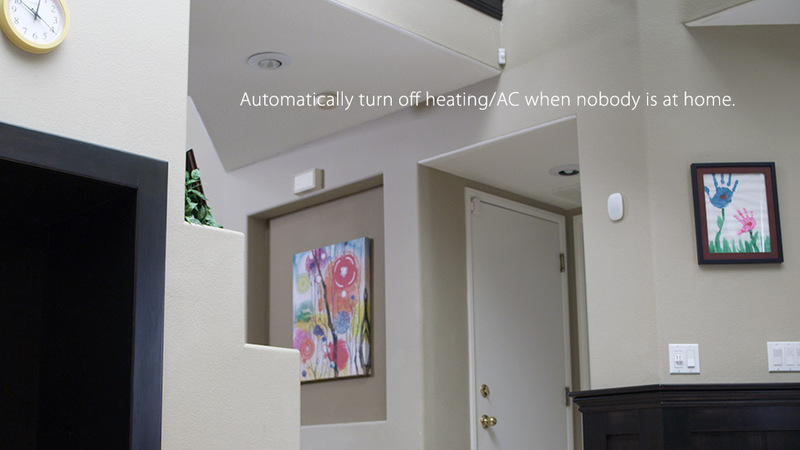 Most other thermostats use mechanical relays (switches) that may emit sound when turning on or off. Kumostat uses semiconductor (solid-state) relays that do not have any moving parts. Therefore, operation is completely silent. Our Patent pending circuit steals a small amount of energy from the HVAC control wires to turn on these solid-state relays, allowing long battery life from a single coin-cell battery, even if the blue "C" wire is not connected. 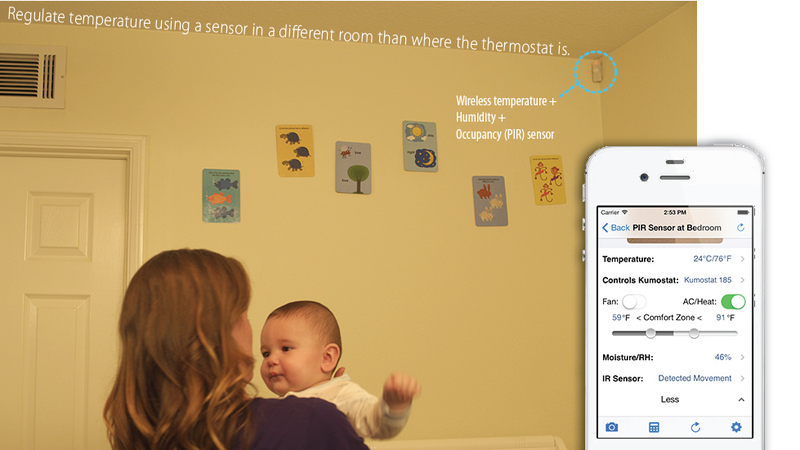 The use of solid state relays and coin cell battery makes Kumostat thinner and smaller than other thermostats. 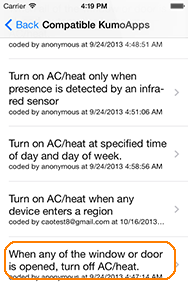 Assign the 7 relays to desired function for each heat/AC/fan level.